The Skinny: Allegorical cop flick from director Derek Chiu is too obvious in its meaning, but the film still survives as an involving, affecting drama. Kent Cheng won a Best Actor award for his portrayal of an ultimately too sympathetic cop. by Kozo: Derek Chiu's cop drama has some obvious political overtones, but is nonetheless a gripping, character-driven potboiler. Michael Wong, Kent Cheng, and Jerry Lamb are three different cops who find their lives turned upside down one fateful day. That day just happens to be December 31, 1996, right before Hong Kong's scheduled handover to China. As such, the three stories are meant to be thinly-veiled allegory on Hong Kong's return. 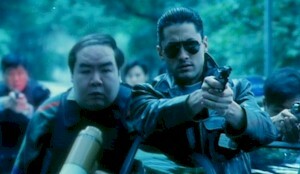 Michael Wong is Dixon, a no-nonsense, no-sympathy, shades-wearing negotiator who earns a suspension when he takes down the wrong man with his gun. Lamb is an irresponsible young cop who wastes his time on the beat - until he gets a sobering lesson in the realities of policework. And Cheng is Inspector Gump, a sympathetic, patient, and understanding cop who finds that his lifelong faith in society's institutions (both political and personal) has been misplaced. All these threads collide in a surprising and emotional climax that provides no easy answers.